I will admit surprise when asked to comment on a historiographical essay. These essays an interesting position in academic circles and do not usually rate debate. If we are frank, in the hierarchies we build in the historical profession they are not granted the esteem of articles grounded in primary research, even if they do rate more than simple reviews. Still, a well-conceived and executed essay has potential reframe a whole field, so commentary might well be warranted. There is no single form for historiographical essays but there are some established troupes. One is evolutionary; that a field has grown and often, by implication, improved as new work has appeared. Hodge slides into this troupe easily seeing changes that have come as improving this relatively new sector of historical research. As the form dictates, earlier work is seen as limited, sometimes even backward. My own work is among the books in his review press-ganged into this role by Hodge. His criticism, much of it borrowed from other reviewers and retreaded, shorts the book as not only too focused on the US but also a failure as a global history of the topic. Of course, these are criticisms of a book that does not, in those forms, exist. Against the works that have failed to deliver the right scholarly progress there are new approaches that offer improved insights. Hodge outlines a number of promising avenues even though elements of his prescriptions that give pause, as when the author pushes forward his own work as a model of what should be done—then again wouldn’t we all? However some of the examples he cites do hold promise to extend and thicken our understanding as there is vast work to be done on a historical topic that is remarkable not only for its scope and depth but for its endurance over time. However, can the established troupe fail to see the diversity of the topic at hand? Hodge misses that many explore the history of development for reasons other that simply explicating a development project or program. Development is used as a way of exploring Cold War strategies, concepts of community, the influence of social science, and a litany of other reasons beyond a pure exploration of the dynamics of development. Hodge himself uses development to shed light on the mechanics of empire. Development itself may figure into bilateral relations between donor and recipient countries (a lens that Hodge mostly peers through) as much as it may be a window on how various ideological encampments executed the Cold War. What is striking, considering some of the criticism he levies against other authors is that Africans, Asians, Latin Americans and others are largely consigned to the recipient side of the ledger. 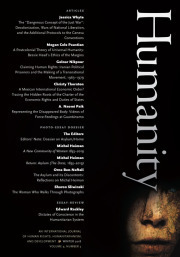 What is missing in his prescriptions for further research is a systematic call to explore how many countries and regions labeled “developing” have utilized a global concept internally and externally not merely as ways to foster putative improvements but as mechanisms for legitimacy as well as political and social control among many other things. These efforts often intersect with transnational concepts of development that are themselves regularly in flux. Hodge is right to state that many in what has been termed the “Global South” sought development in many forms. But historians can do much more to see them not merely as one side of the exchange but as those that can have initiative in the process. International development shaped and shapes power struggles and intergroup relations within regions where it is taking pace. How a local government harnesses international development concepts for their own ends what happens within that society as well as how the outcomes are viewed internationally is an area that cries out for more study, particularly in the postcolonial context. If there is some this local frame Hodge also underplays the global and transnational with a focus on nation-state and imperial packages. Take just one possibility. Histories of development can benefit from greater understanding of not merely the actions of particular states, individuals, or organizations but the transnational international development communities (there are and have been many). This is not just at the level of discourse—what are and were acceptable forms of development practice—but how this community was constituted at different times and places, under different ideological regimes, and to conduct different development program. Here is one space where actors from the “developing” or “Third World” can often be found as there has been a long tradition of participation by various figures and groups outside the West. Finally, while there is some implicit discussion, the politics, meaning formal party structures and ideology, as well as the public contestation of and for power is largely missing. Hodge is right that the neoliberal turn had an impact on how international development was perceived but it has remained a topic shot though with ideology. This segues with the question of why authors are asking the questions of development that they do. Not all ask merely to explicate what happened on a specific project but why development was deployed and the ends it served. Development as a general and even generic concept has become a fundamental part of modernity and one justification for the construction of what might be termed somewhat simply as “the good society” within it. The place of the state in constructing whatever “good society” is sought is a perennial question and one that is quite relevant to development and realms of inquiry beyond it. Accordingly, illuminating questions on the history of development may not be ones specifically crafted to explore development per se. There is a reason why neoliberal organs like the Economist crow with the assertion that more people have been lifted out of poverty by liberal capitalism, often in contrast to state-led programs. It making justification for a prevailing ideological system on the back of a putative developmental accomplishment. This is just one reminder development in its many forms is often bound to ideological imperatives yet this relationship opens up many vistas for historians to explore. Hodge’s own stated background as a disabused developmentalist may come into play in his views. He sees good work in the history of development as a tool to improve the workings of development today. That is certainly a worthy goal as the development community can be rigidly forward-looking and, rather like some scholars, look to earlier efforts only to draw distinction to show that work done in the present is superior. At the same time, historians and others working on development in a historical vein should take care not to tailor our work to the needs of the policy realm. Many other important issues are involved and intersect with the history of development. Some of the limitations Hodge sees in earlier stages of development’s history actually reflect the rich diversity of historical debates and areas of inquiry that are tied to it. For example, wealth of work on the role of the United States in international development is both a function of the scale of the field and that many scholars take the history development in hand as a means to shed light a variety of historical questions. I would doubt that many of the scholars who focus on the US role would assert that American approaches to development are synonymous with the whole of global development and see it as excluding other views (certainly this historian has not). No work is a final statement but a starting point for new projects. Still, there is a need do more to acknowledge the vast collection of perspectives and voices on the issue and actively cultivate work that continues to broaden the avenues that Hodge as well as others have plotted. Indeed, significant segments of Hodge’s program for future research have already been undertaken. But let us listen to our own understandings of development’s history and take care with being too prescriptive. Its history may just be as complicated as development itself. It may be best tackled without strictures to govern inquiry and with a sense of the broad spectrum of historical themes to which it is tied. Nevertheless, it is a expansive and fertile terrain with many paths that promise illuminating scholarship in the future. Take, as just one example, Daniel T. Rodgers, “In Search of Progressivism” Reviews in American History 10:4 (Dec., 1982), 113-132, which repositioned scholarship on an entire area in US and transnational history. The Great American Mission is a “cis-international” history: a study that explores one element in a much larger area of inquiry. It explains how the US utilized a model of development that, while international in its origins, could be repackaged as type of development reflective of particularly America liberal ideas. While the book focuses on US efforts it shows that these were often arrayed against fascist and communist claims that their own systems could produce a better standard of life. In other words, a US effort at global development, from the 1930s forward, was always influenced by and acknowledged the presence (and threat) of other systems of development. The classic statement of how and why ideology drove Cold War interventions by the US and USSR is Odd Arne Westad, The Global Cold War : Third World Interventions and the Making of Our Times (New York: Cambridge University Press, 2007). Historians might well have something to learn from anthropologists here. An early and classic work on how international development was an internal power struggle in the Shah’s Iran is well told in Grace E. Goodell, The Elementary Structures of Political Life : Rural Development in Pahlavi Iran (New York: Oxford University Press, 1986). On the idea of community in development see Daniel Immerwahr, Thinking Small: The United States and the Lure of Community Development (Cambridge, Massachusetts: Harvard University Press, 2015). Hodge notes Eric Helleiner, Forgotten Foundations of Bretton Woods: International Development and the Making of the Postwar Order (Ithaca: Cornell University Press, 2014) but there are other examples of this, such as remarkable biography of the influential Edgar J. Dosman, The Life and Times of Raúl Prebisch, 1901-1986 (Montreal: McGill-Queen’s University Press, 2008). “Towards the End of Poverty,” The Economist, June, 1, 2013, http://www.economist.com/news/leaders/21578665-nearly-1-billion-people-have-been-taken-out-extreme-poverty-20-years-world-should-aim, accessed March 24, 2016. For an example of a case study in Soviet international development (in context with other international actors and trends) see Timothy Nunan, Humanitarian Invasion: Global Development in Cold War Afghanistan (Cambridge: Cambridge University Press, 2016); on global environmentalisms impact on international development see Stephen J. Macekura, Of Limits and Growth : The Rise of Global Sustainable Development in the Twentieth Century. Global and International History (New York: Cambridge University Press, 2015).